On November 1st, we had the Alternative Lifestyles workshop, Disability group, and the Gender Empowerment group. NEW GROUPS NOW IN SESSION!!! 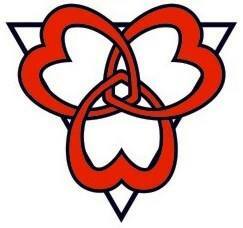 We are happy to announce two new groups to the ALCC!!! We thank these wonderful folks for bringing these fantastic new groups to the ALCC and wish them all the best in growth and development of their endeavours! The Gender Diversity Group met on Sunday, Dec 11, and while sparsely attended (holiday season does that! lol!) the discussion was lively and interesting. One thing that has become apparent is that those who are gender fluid need to be protected by law. It is hard enough being transsexual in a workplace, but those who are gender fluid can face some even harsher discrimination. For some gender is binary, for example male or female, but for some it is more than that. And society does tend to ignore this, despite the fact that it is increasing. Yes, the ALCC was at the Pride Parade too! On Sunday, August 13th, 2011 (or is it 3011 since that was the theme? hmmmm) we took part in the parade, marching proudly with the banner, between the CFI (Centre For Inquiry) and Monsieur Cuir. We had quite a few join us in the parade, and we all did what we could to be festive, cheer on the crowd, and thank the crowd for coming. It was a long parade route, starting at Guy and Rene Levesque and going all the way to Saguinet. Not something you want to do in heels lol! Or while wearing a full female mask with PVC outfit! A couple of us learned a lesson or two from what we wore, but yanno… it was worth it! Although the temperature was not as high as Saturday, we all drank a whack of water along the way. The crowd was receptive, happy, cheering, and enjoying the parade. Some of us were even asked to pose for photos either alone or with others! A big thank you to the spectators again for showing up, showing support, and cheering on the parade! “Jesus” even showed up! 😉 He marched with both us and the CFI, which made for some interesting photo ops! After the parade, though, we simply had to find somewhere to sit, relax, and regain energy so a bunch of us from the ALCC and CFI stopped at the St Supplice for some water, beer, sangria and munchies! The walk back to the car also turned a lot of heads too lol! Thank you to all those who marched with the ALCC!!!! You really made a difference and your support for both the ALCC and Pride is truly truly appreciated! 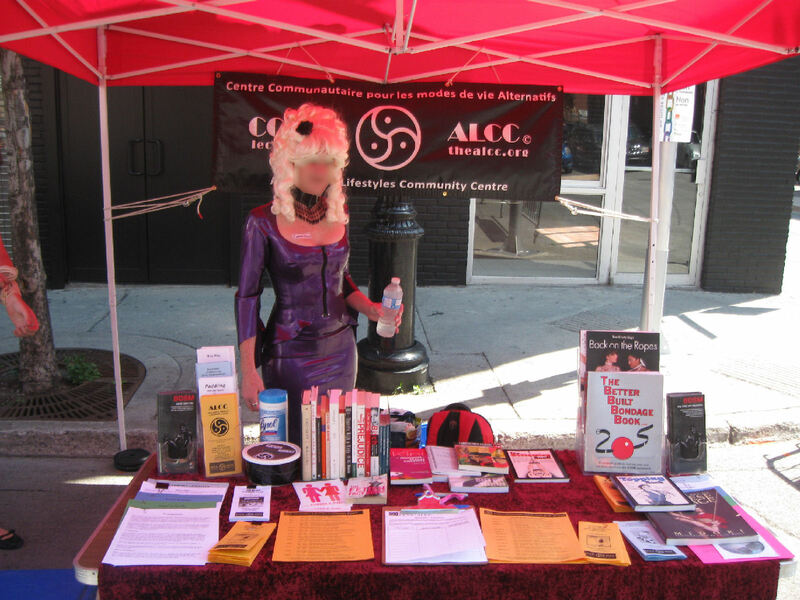 ALCC at Pride Community Day! 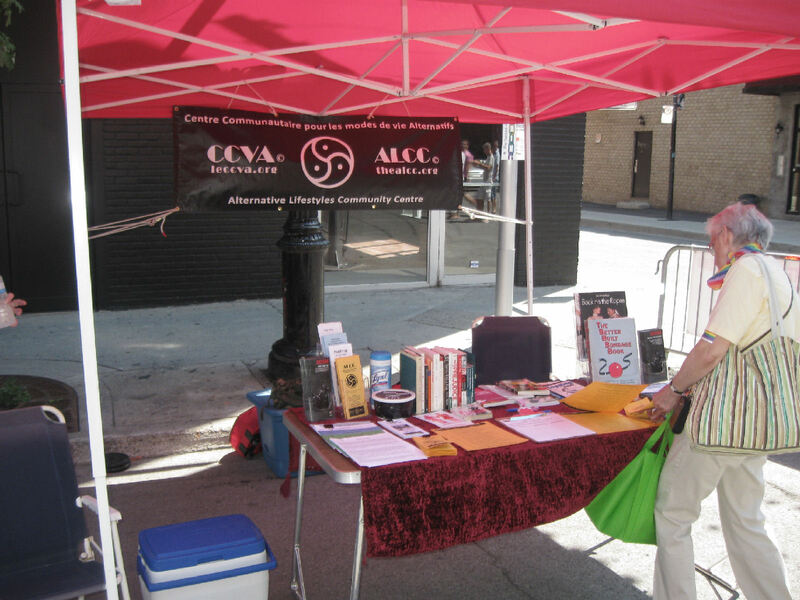 The ALCC was at Montreal Pride Community Day on Saturday, August 13, 2011 with a booth at the corner of Montcalm and Ste Catherine, providing information on the center and as well of course alternative lifestyles and marginalized identities. Contessa Alura, Petal, Vanessa and Amelia volunteered to be the reps on site that day. It was a beautiful hot and sunny day, perfect for the community day! A little hot for perhaps Contessa Alura in her purple latex dress though! lol! We all drank a good share of water needless to say! Petal performed a rope harness on Vanessa (moi! 😛 ) and there was quite a bit of interest in the center, materials, and what we do. I think we came close to running out of ALCC pamphlets! Hope to see some that stopped by that day at the ALCC in the near future!